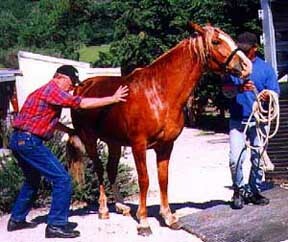 PART ONE OF A FIVE PART SERIES ON HORSE TRAINING. How will she be under saddle? In the spring, horse people's thoughts turn to: Training! One of the most thrilling parts of raising horses is the excitement of finally seeing them ridden. Those initial saddlings are times of thrills and chills, elation and disappointment. The beautiful, strong, healthy, correct baby that you've been drooling over for three years can turn out to be a dud under saddle. And the mutt you've hidden behind the barn may turn out to have heart that covers up all defects. 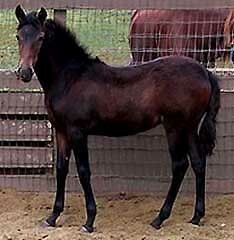 So, as soon as the weather clears up, horse people naturally wonder: How will those colts and fillies shape up? And-- Will I be killed? No. We are not afraid! If we are, we just send the monsters out for training-- right? We Nathans train our own horses here at Rancho Vilasa. This year, we had three fillies to put under saddle, a gelding going into bit, assorted touch ups and tune ups-- and the show season to survive again. We were midway through our 1999 Spring training when I realized, "Wow! This is great stuff for the web site! Real ranch life! Raw, unedited training pictures!" Unfortunately, a large part of the training process with the fillies was already done, so you miss the initial training stages here, but not all the rodeo. What kind of training do we do at Rancho Vilasa? Modified Peruvian training. What does that mean? We use Peruvian tack. We take the horses through the stages of bosal, four reins and bit. We do limbering exercises. We ride them in gait. We use a round pen to start our youngsters. We use it as an attention getter and a safety device. We do not chase our horses around the pen until they're panting and dripping sweat and call that "round pen" training. We're very open to the new, humane training techniques. In particular, we're fans of Harry Whitney. He's worked with our horses in the past and would have put the three fillies under saddle-- expect that when we called him in mid-1998, he was booked through 1999. (Tried again this year. He'd booked through 2004.) 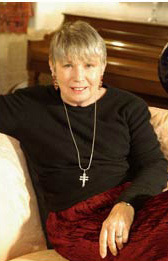 Try Harry's web site for more information. 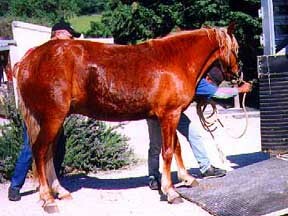 CORCOVADO ILLUSTRATES THE "MULE TECHNIQUE"
Corco illustrates the "planted feet" aspect of the mule technique. 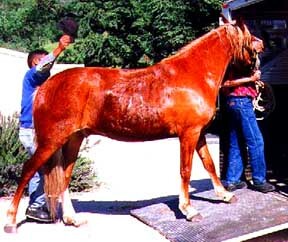 His basic good temperament and willingness to enter the trailer is shown by his left front foot, which is placed about 2" onto the ramp. Barry and Tony will have no trouble getting him in the trailer! NOTICE THE PROGRESS BETWEEN PHOTO ONE AND TWO! 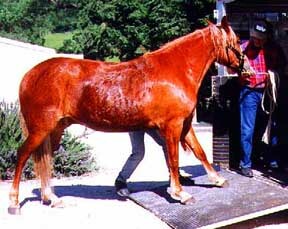 Superb horsemanship has allowed our trainers to levitate the mule like Corco in front of the trailer. Note postures of Tony & Barry. 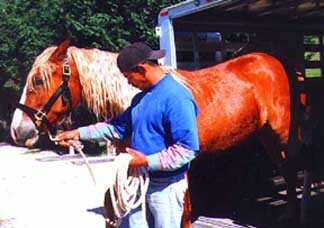 These allow the leverage needed to eventually get the horse into the trailer. Note left front foot! That's progress! MORE PROGRESS! BOTH FEET ON THE RAMP! In a bold display, Tony picks up Corco's left front foot and places it father up the ramp! Only three more legs and a few more feet (pun!) to go. Some people use time honored training devices such as carrots, apples, grain and monetary bribes at this point. TONY USES THE "WAVE THE HAT" TECHNIQUE! Note that Corco's feet have essentially not moved. Other people use the "longe whip" or "broom handle" techniques at this point. Followed by the "2 X 4" technique. These are not nice. Well, so, okay. He wouldn't load. So what. GETTING OUT IS EASIER THAN GOING IN! Almost immediately after the previous pictures, Corco gave and and walked into the trailer easily. The most important thing to remember in trailer training is: The horse won't go in unless he wants to. You can't make a 1,000 pound animal do anything. So, eventually Corco gave up. He loads great now. A sign of the relaxed state Corco maintained during this lesson is the almost catatonic expression on his face. With today's new, natural training techniques, a horse never has to be stressed. Only you will be stressed as you pay for his food, the trailer, and so on. This doesn't matter. 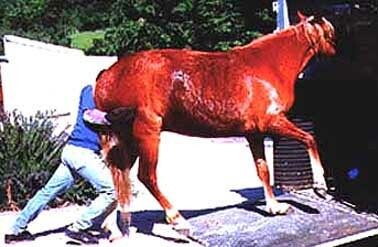 See the article on Horse Addiction. The caption to this picture is not quite true. Unloading a horse can be as hazardous ad loading. I once rode out of a trailer plastered to my bolting horse's shoulder. Something I'll never forget. Fortunately, I picked up my feet.